Down 3-2 early in the third period, Grand Rapids Griffins fans let the home team know exactly what they wanted. The Griffins didn’t need a reminder of what was on the line, but a not-so-gentle suggestion from the fans certainly doesn’t hurt. In the end, the Griffins delivered, but they needed to go through adversity to get it. Martin Frk’s shot from the blue line beat Mike McKenna at the 12:41 mark of the third period — the first time the Griffins held a lead in the game — and Grand Rapids held on to beat the Syracuse Crunch 4-3 in Game 5 and win its second Calder Cup title in five years Tuesday. The Griffins faced deficits of 1-0, 2-1 and 3-2 in Game 5, but each time the Crunch took the lead, the Griffins weren’t ready to give up. Tyler Bertuzzi’s goal 3:50 into the third period off a nice feed from Frk tied the game at 3-3, and it would be the last time the Crunch led the game. It was Bertuzzi’s 23rd postseason goal, which passed Teemu Pulkkinen (22) for most in franchise history. While constantly playing from behind might be hard for some teams, if you ask the Griffins, one-goal deficits don’t bother them. The Griffins are no strangers to overcoming adversity. They were 5-4 during these playoffs when allowing the first goal. Those four losses signified the four times the Griffins lost during the Calder Cup playoffs — once each in the second and third rounds and twice to Syracuse in the final. Even after a humbling 7-3 loss to the Chicago Wolves in the second round, the Griffins didn’t let one bad game affect them and went on to win the next three games to win the series 4-1. When the Griffins won the Calder Cup in 2013, the Griffins had two opportunities to win their first title at home, but the Crunch forced a Game 5 and a Game 6, which the Griffins won in Syracuse. This season, the Griffins again would have two opportunities to close the series at home but only needed the first opportunity to celebrate a championship on home ice. Both teams were perfect at home entering the final, but only the Griffins came out with their perfect record intact, winning all 10 playoff games at Van Andel Arena. And the fans love seeing the Griffins play at Van Andel. It didn’t matter if it was a goal or clearing the puck on the penalty kill, the sold-out crowd of 10,834 roared each and every time the Griffins gave them something to cheer about. “It’s real sweet to win it on home ice,” said Callahan, who along with Nathan Paetsch and Brian Lashoff were on the 2013 Calder Cup-winning team. 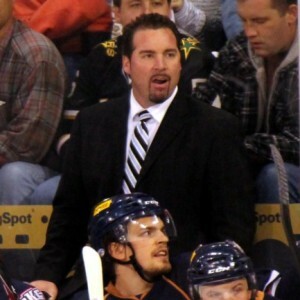 For Griffins coach Todd Nelson, he was able to exercise some personal demons, as he was the coach of the Oklahoma City Barons team that lost Game 7 at Van Andel Arena in the Western Conference final to Grand Rapids during its Calder Cup title run in 2013. And while the fans ultimately don’t have any say in what happens on the ice, Nelson appreciates the support the Griffins have had all season. The Griffins and their fans are happy it went their way.